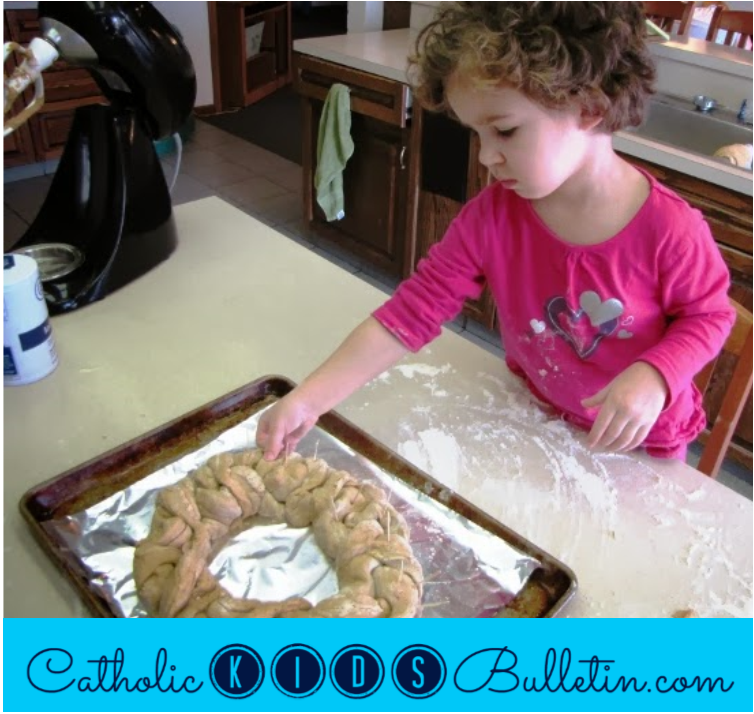 Traditions are an important part of our household--and Mady will be quick to remind us of any traditions that we accidentally/on purpose 'forget' with each season. 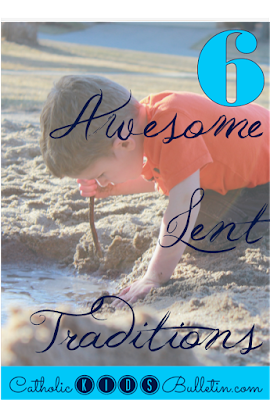 Here's a roundup of our favorite Lenten Traditions! 1. Fat Tuesday and a King Cake: The day before Lent begins, we empty the house of all the junk food and deliciousness that we're giving up for Lent. 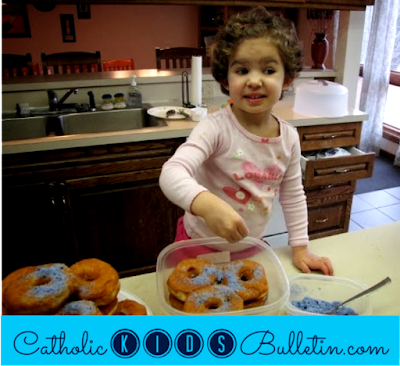 We usually have pancakes or gumbo for dinner (Mardis Gras), and enjoy a king cake for dessert. I have plans to make something semi-fancy this year, but anything sugary and colorful will fit the bill! 2. Ash Wednesday: Even though this isn't a Holy Day of Obligation, Mass will be PACKED! We'll find a time to get the kiddos to church so they can receive ashes as well. Especially for our little ones, this is a chance for them to walk up and receive something since they aren't old enough for the Eucharist. They LOVE the chance to feel so grown up! The meaning will be lost without some explanations, so we'll try to include those as well. 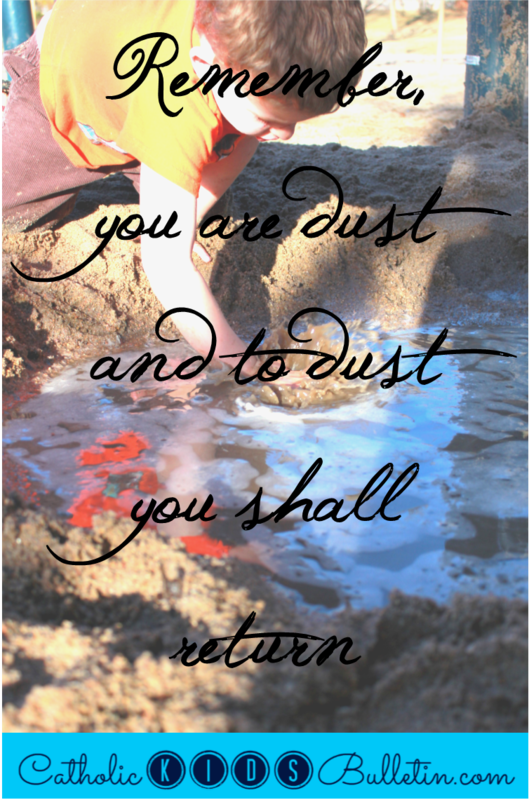 I love that Ash Wednesday is such a concrete start to the season, along with the fasting and abstaining. Small children don't really understand the concept of a long-term goal, so this takes some reinforcement and encouragement throughout Lent. I'm going to focus on the prayer, fasting, and alms giving listed in Matthew 6 and help them chose something in each area. I plan to choose a prayer for us to learn as a family--let me know if you have any suggestions! I'll encourage their alms giving to be an act of kindness every day. For fasting, they can focus on choosing one thing to give up that will be individual for each kiddo. I'm also going to make sure that my kiddos know what my goals are so they can help me to be accountable! A stern reminder from a 3-year-old will quickly give me the impulse control I need to resist that extra snack. For my high school students, they will choose their own goals in each area. We're going to discuss Lent next week, do some hefty pre-teaching about goal setting and sacrifice, then they'll get a hand-out to write out their goals. The accountability of writing a goal is so important! 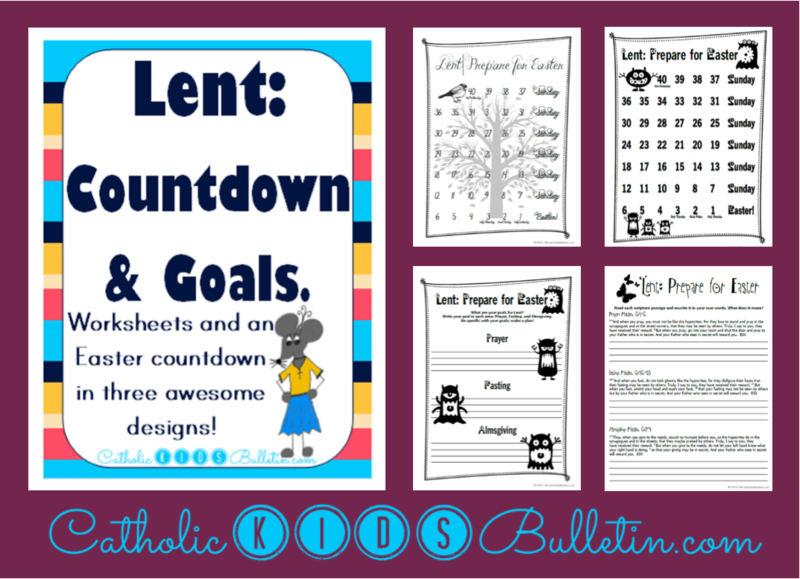 I created a packet with Lent Countdown pages (for littles and bigs alike) and worksheets for them to complete focusing on Matthew 6 and goal setting. There is even a follow-up worksheet that we'll use each Friday to review the goals-along with successes and challenges. You can check it out over at Teachers Pay Teachers. 4. Stations of the Cross: We'll try to attend Stations of the Cross at church a few times during Lent. By Friday evening, I'm usually less-than-motivated to do anything outside of the house, so we'll see how many times I can make that sacrifice. 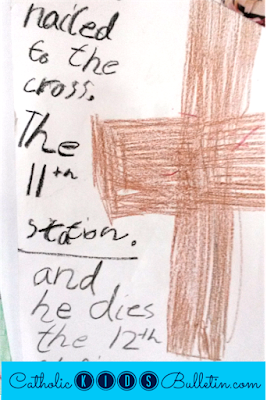 Last year, I taught and prayed the stations with Mady's Faith Formation class and few times, then gave the students a chance to draw a few of the stations. They chose their own station and design and truly enjoyed the chance to express their view of the stations! 5. Meatless meals on Fridays and Ash Wednesday. This one is pretty basic, but I thought it was worth mentioning. Plus--I love this picture of Mady chowing down on these ribs! 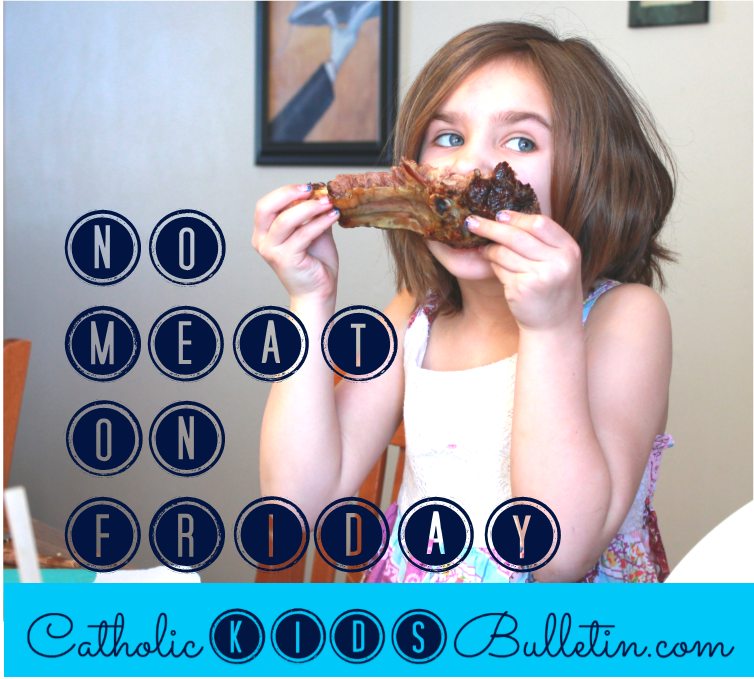 Remember that meat is off limits, but meat stock, eggs, and milk are still fair game. So, if you're worried about a meatless meal--a veggie soup or chili with beef stock will still taste just as filling and meaty as you're expecting, even with the sacrifice. My go-to Lenten meals are fish tacos, cheese pizza, and mac and cheese. Yum! I have to admit--the meatless meals aren't too much of a sacrifice for me, but it IS something that increases my vigilance during Lent. It's so easy to forget that it's Friday and Friday is different! 6. Something crafty! 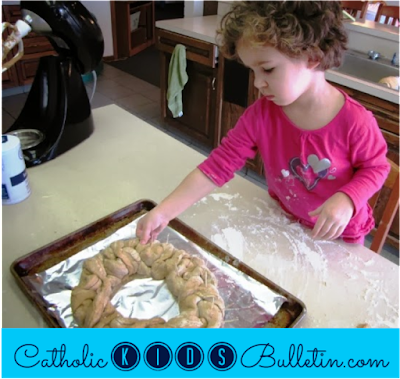 We make a crown of thorns each year with pla-do or salt dough. My go-to recipe for pla-do is 1 c. flour, 1/2 c. salt, 1 t. oil, 1 t. cream of tartar, food coloring, and 1 c. water. Heat on the stove while stirring, and watch the magic happen! I've made the crown different colors each year--this year, I happen to have black food coloring so it will be pretty dark. In this picture, I think I used cinnamon because I was out of all Lenten food colorings. There's my top 6 Lenten plans for this year, is there anything awesome that I'm missing? For more traditions, check out this post from 2013, and remember to print a bulletin for Ash Wednesday!